Christina Tosi loves dogs. So when an animal rights activist group protested Momofuku Ko for serving foie gras, the pastry chef began brainstorming ways the restaurant, and all of its brethren, could give back to the animal community. Although menus have not changed, the Momofukus have changed their ways. Now, instead of being discarded, the bones left over from cooking (not the bones left on customers' plates) are being donated to animal shelters throughout New York City. Read the entire article at The New York Times. On Sunday, June 21, The FCI's Student Forager Club took a walking/snacking tour of Chinatown with Jennifer 8. Lee, New York Times reporter and author of The Fortune Cookie Chronicles, a book on the history of Chinese food in the United States and around the world. What better person to follow around the crowded streets of Chinatown? Jennifer 8. Lee is extremely knowledgeable about Chinese-American culture and cuisine, and can read and speak Chinese fluently. Over the course of a few hours, the lucky students had the opportunity to try many of her favorite places in Chinatown, sampling pulled noodles, dumplings, ice cream, kabobs, and other treats, before heading back to campus. Quench Your Thirst. Read the New Blog. Alexis Kahn is Director of Beverage Education and General Manager of L'Ecole, the restaurant of The French Culinary Institute. 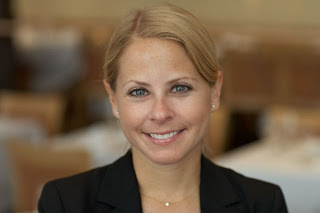 Previously, she held management positions at some of the city's finest restaurants, including Tribeca Grill and Eleven Madison Park, and has studied with The American Sommelier Association, The Wine and Spirits Education Trust, and The Court of Master Sommeliers. So you could say she has some experience in the beverages arena! Her new blog, A Thirsty Spirit, covers wine, beer, spirits, coffee, and all manner of beverages. Read it, learn everything you wanted to know about the world of beverages, and get your thirst quenched! And when you're ready to enhance your knowledge with some formal training, enroll in one (or more) of her Recreational Beverage Courses at The International Culinary Center. Her single-session Wine Uncorked class takes place on July 14 from 6:30-9:30pm, and the six-week course on Food & Wine Pairing, starts September 9. Classes fill quickly so don't wait to enroll! On another successful club outing, Sixpoint Craft Ales opened their doors last month to give students a tour of their brewery in Red Hook, Brooklyn. Led by owner Shane Welch, the tour began in the grain room, where students had the opportunity to taste and learn about the various types of roasted barley and wheat used to brew the different types of beers. After in-depth lessons on the brewing process, and entertaining stories of how the brewery came to be, the tour ended with a group sampling of several Sixpoint brews, including a perfectly-balanced Saison. The International Culinary Center's first Food Blogging class has graduated but the blogs created will live on. Taught by Steven Shaw, James Beard Award-winning food critic and founder of the phenomenally successful website eGullet.org, the eight-week course covered the A to Z of food blogging, from picking the right software and sharpening the blog's focus, to blog promotion and monetization. By the end of the course, each student had their own fully functional food blog. Diverse in background as well as in focus, the students produced quality blogs that will surely be maintained long after the class has ended. If you love reading about food, check out the student blogs below. 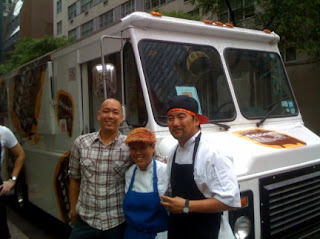 On Monday, two hundred midtown lunchers got a sneak peek sampling from NYC's next street food phenomenon, Kogi BBQ. From noon to 1pm, the Kogi crew guest-starred on FCI alum Jerome Chang's Dessert Truck to serve Kimchi Quesadillas and Chang's famous chocolate mousse with peanut butter center. All proceeds were donated to Citymeals on Wheels. Check out the play by play on Eater, reported live from the scene. Born and raised in L.A., the cultishly followed Korean taco truck plans to open their first NYC "location" by the end of the summer. 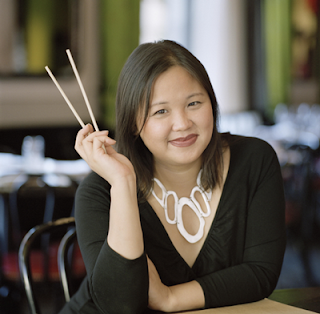 Chef Lee Anne Wong (Classic Culinary Arts '01), of Top Chef Season 1 fame, has been named Executive Chef of East Coast Operations and will head the new truck once permits have been secured. Follow Kogi on Twitter and stay tuned for updates. Written and practical tests are becoming easier for everyone in class, or at least it feels more relaxed this time around to me. We tackled the puff pastry final on Tuesday by making various things out of inverse pastry dough such as vol au vents, cheese straws and apple galettes. 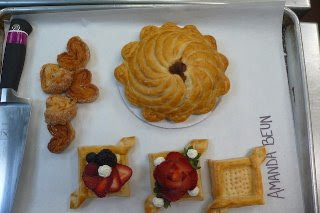 The test marked the last day with my partner Amanda, who presented the chef with an impressive tray of quick vol au vents, palmier and a Pithivier for evaluation. 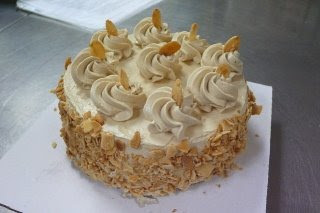 On Thursday we eagerly began the first cakes unit and made Génoise cake with butter cream frosting and pound cake. My new partner is named Debora Kang. When she’s not baking, she lives in New Jersey with her parents and is a waitress at a Japanese restaurant. 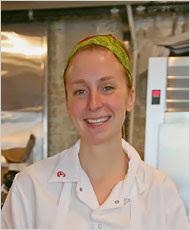 Chef Cynthia is absent for a professional development course she’s taking over the next four Saturdays, leaving Chef Peter in charge. We made a chocolate ganache cake and one of my favorite things to eat in the world—angel food cake, which I devoured at home with strawberries and whipped cream. We also made a dacquoise, which is a thin cake made with nut meringue that we then stacked and layered with coffee flavored butter cream (Deborah’s cake is pictured).